Considering Bangkok as a destination to explore on your romantic honeymoon? This non-stop city is famous for its temples, night markets and unforgettable dining experiences. With so much to see when you’re there, we’ve rounded up our top 10 amazing things to do on your Bangkok honeymoon to inspire your first adventure together as a newly married couple. At Honeymoon Dreams we can plan your perfect Thailand honeymoon call us today on 0121 440 6268 or contact us online. Love the idea of spending a night in a tree house? 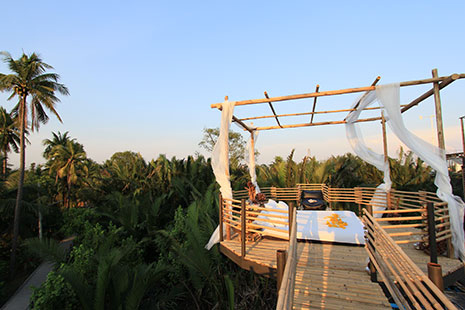 Bangkok Tree House is an eco-friendly hotel compromising of cozy nests. For something extra special we love the “View with a Room’ where you can sleep under the stars – this experience is ideal for those that love to be with nature (no electricity in the nest) where you’ll be perched 7 metres in the air and the lush mangroves surround you. These nests feature complimentary breakfast for 1 night, free bicycle rental and cell-phone rental. Trade the bustling streets of Bangkok for an afternoon of tranquility at Organika Secret Spa, which is inspired by The Secret Garden with bright and airy rooms that make you feel relaxed with minimalist and tropical interiors and treatment rooms to make you feel a world away from the city. Why not book a half-day spa for two, with 4.5 hours of relaxing treatments to enjoy. There’s also a café here too to enjoy drinks and brunch after or before your soothing spa treatment. The breathtaking Grand Palace located in the heart of Bangkok is one of the city’s most popular attractions. This former residence for King Rama I to King Rama V can now be explored, discover the history of the palace walls, see the magnificent Temple of the Emerald Buddha and explore the stunning Buddha Ratana Starn and Sidhala Phirom Halls. Celebrate your honeymoon in style at Vertigo TOO, which is located on the 60th floor of Banyan Tree Bangkok. Views of Bangkok’s bustling city can be enjoyed day or night, with a delicious weekend high tea menu and by night, is transformed into a lively hub with live music and fantastic mixologists. There are so many different ways to get around Bangkok; by boat, tuk tuk, car and Sky Train. If you’re looking for speed, the Sky Train is an efficient way to explore the city and the best part is the spectacular views you will both enjoy. As seen in many photos, Wat Arun is undoubtedly one of the most beautiful temples in Bangkok. Its location by the riverside is striking at sunrise and sunset. If you’re an active couple, why not take the challenge to climb the steep central prang steps and admire the gorgeous views of Chao Phraya River, Grand Palace and Wat Pho opposite. Take in the gorgeous views of the lush green park and skyline beyond from the infinity pool at SO Sofitel Bangkok, which is located on the 10th floor and extends over 32 meters. Feel as though you are swimming in mid-air as the city beyond is in view. At night, the pool is spectacular with LED ever-changing lights, which looks magical! If you’re not staying at this hotel, you can purchase a SoFIT one-day pass which gives you access to the infinity pool as well as fitness center, classes, experience shower, steam room, sauna and more. A dinner river cruise along the Chao Phraya River is high on most honeymooners list of romantic things to do in Thailand and we can see why. The views of Bangkok at night with the Wat Arun lit up and the glimmering lights of the city in view with last with you both for a lifetime. The Shangri-La Horizon river cruiser serves high quality Thai and international buffet dinner as you pass historic architecture such as the Grand Palace and the Temple of Dawn. Renowned for its floating market, a visit to Bangkok wouldn’t be complete without hopping into a long-tail boat and navigating your way through the bustling markets that line the waters. One of the most popular markets is the Damnoen Saduak Floating Market, which invites travellers to shop, eat and take in the ambience. Tours can be arranged for the floating market by our Honeymoon Concierge team after you have booked your honeymoon with us. Siam Paragon boasts of over 250 shops including high-end fashion brands, a 16-screen cinema and a large variety of restaurants offering flavours from around the globe. With 4 floors of shopping heaven, you could easily spend hours shopping until you drop at this mall, which sells everything from fashion, electronics, home ware and much more. Planning your honeymoon to Bangkok? Contact us about Thailand Multi-Centre Honeymoons. Call us on 0121 440 6268 or enquire online.